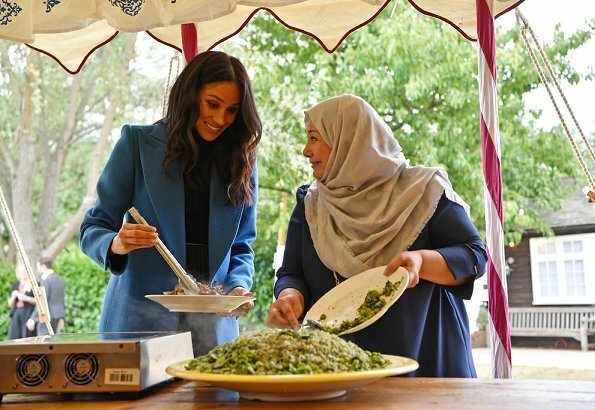 The Duke and Duchess of Sussex, and Doria Ragland, the mother of the Duchess of Sussex, took part in the launch of a cookbook with recipes from a group of women affected by the Grenfell Tower fire, held at Kensington Palace on September 20, 2018. 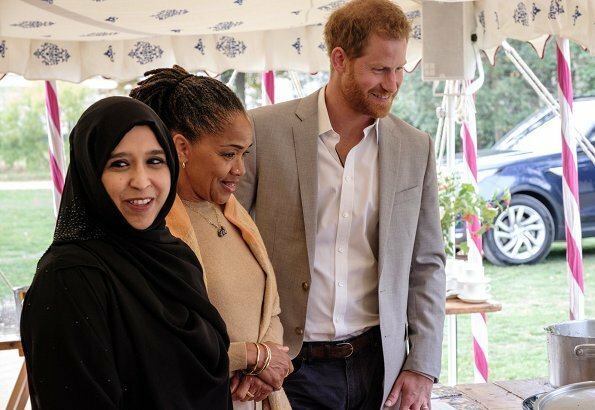 That event became the first event of Meghan and her mother Doria since the wedding in Windsor in May. 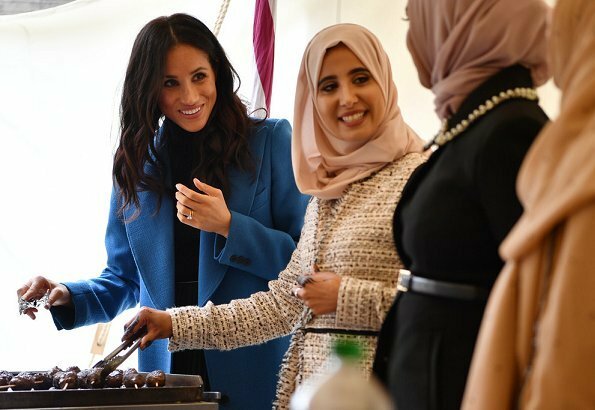 The Duchess of Sussex supports the publication of a cookbook which helps families affected by Greenfell Tower tragedy. 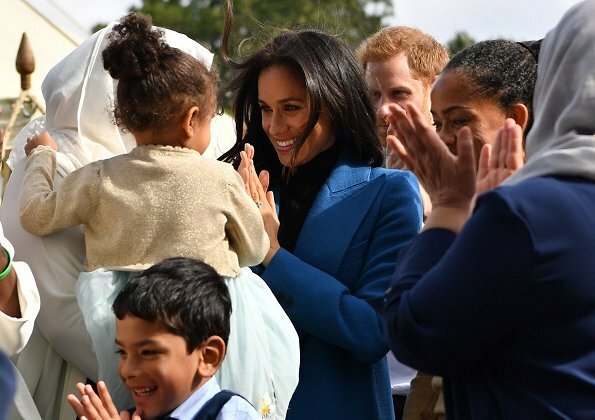 Doria is lovely, so is Meghan, I do like her blue coat. Mom looks lovely but she should stay home or be among the crowd. How often do you she the royals in Europe bringing their parents to engagements. Think about it? Kate, Charlene, Maxima, Mary, Letizia ? Actually Mary´s father was at time very much seen in Danish events. Catherine´s parents, sister and brother are sometimes there also. Maxima´s father had too close connections to junta of Argentina to let them take even part to Maxima´s and Willem Alexander´s weddings. I see no reason why her mother should not be right where she is. They are Royals not GODS, they look wonderful and are having a great time. Harry was the third wheel with William and his wife, and today with Meg and her mom. :):) Very cute. Why wouldn't Megan have her mom join her? If my mother was visiting me I would also invite her to meet some fabulous ladies and eat some delicious food. Her outfit was appropriate. And Doria is adorable. Agree, and they both have very stylish outfit, warm smile the best accessorie. Thank you for the wonderful comment about her mother being at the event!! Meghan and Doria look lovely. Like the blue coat. The Duke and Dutchess are adorable together. Meg and mum look perfectly attired for the event. Looking forward to getting a copy of the cookbook. What a lovely relaxed event. The coat is lovely and a nice contrast against the black. Harry and her mum look so proud. Exactly! I love seeing Harry so happy. The smile he has on his face looks bigger and happer than ever before. He is so very in love and content. Doria looks lovely, and it's wonderful to see her being included. I love seeing the newer royal families (Kate and William, and now Meghan and Harry) including the in-laws. This is what family is all about. Agree with you both. Meghan looks lovely and everybody so happy and relaxed. Ici c'est un evemenemt lié à une action de charité. C'est son projet et elle a le droit d'inviter sa mère. Elle et son mari la soutenait. D'autre part vous connaissez ses goûts en matière de couleurs. Le noir n'est pas lié seulement au deuil. C'est aussi une couleur professionnelle. Cela la rien à voir avec ses origines.Et elle est assez intelligente pour savoir quoi porter. Ce n'est pas elle qui est mise en valeur mais ce groupe de femmes qu'elle a aidé dans la réalisation de leur projet. Thank you for the perfect comment! I am surprised at all these negative comments. Black is a colour which suits very well some women; if so no reason to reject it. In this case she has a blue coat which provides the adequate colour touch. Her mother? yes not an official event. Some flexibility in mind sets is highly appreciated. Maybe her mother would like to continue to be involved in the project, she must be looking for some activities in London. And it shows that she cares for her parents when they behave adequately (contrary to some others in the family). For those who have cast negative comments on here, can I ask you to look at what the event stood for. What this community went through and are still going through ! 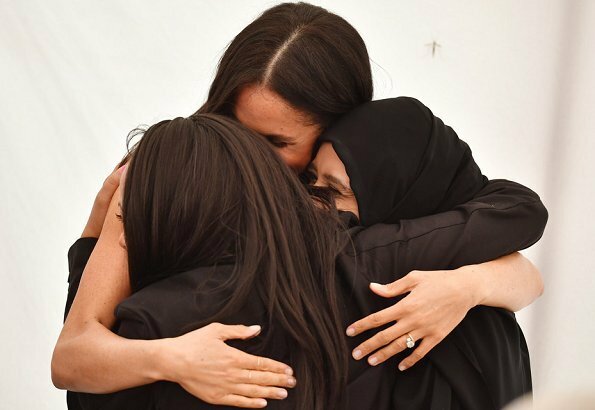 To have Meghan come along, and bring a beacon of light and hope to their situation can only be a good thing ! 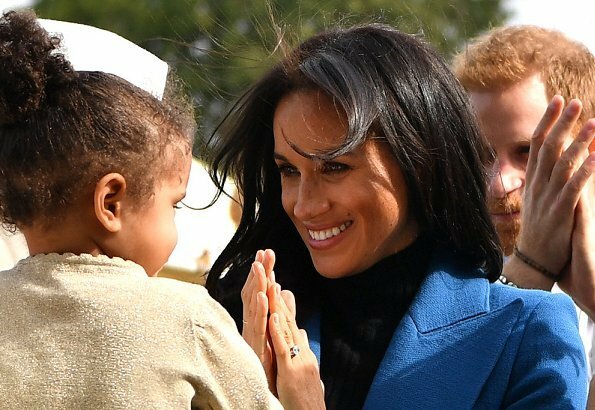 It meant that much to Meghan, she asked her Mother to fly the thousands of miles to be at her side ! How can anyone find a negative thought to that scenario ? As for what she wore, If I'm honest, she could have turned up in ripped jeans, and it still wouldn't have taken away from the purpose of today ! 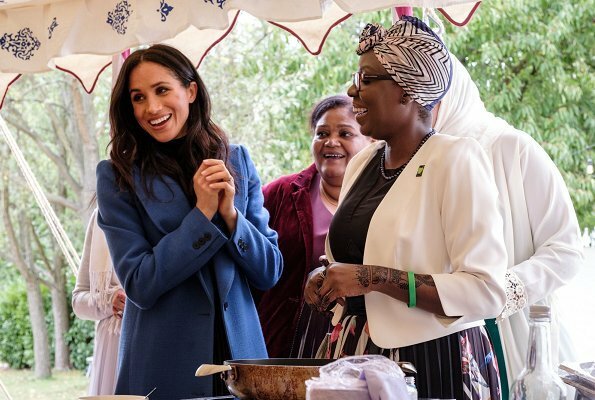 All kudos to Meghan and Doria for making this happen, for bringing such hope to this group of amazing and brave women ! Meghan always looks really good in black, and her being there together with her mother and husband is lovely and human. Love it all. I just love the cookbook! moving Doria from the USA to the UK? I think she is pregnant 😉 or at least I hope! Ladies, please do not accuse others of "hate" or having problems with the colour of Meghans skin. Why such alligations? 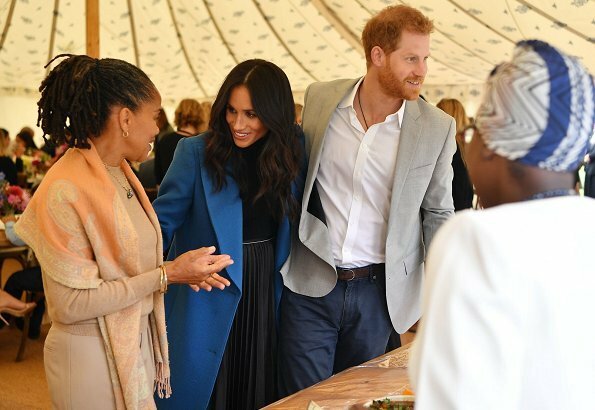 I also think that it is not a good idea of Meghan to bring her mother to this event. She is still a newcomer-royal and must be aware of the fact that she is not a private person any more! Whatever she does, she does under the very watchful eyes of the british taxpayer - and she still has the image of an "immodest attention-seeker". At this event here some have criticised her and her mother for treating Harry as a nobody and for pushing their way into the foreground. 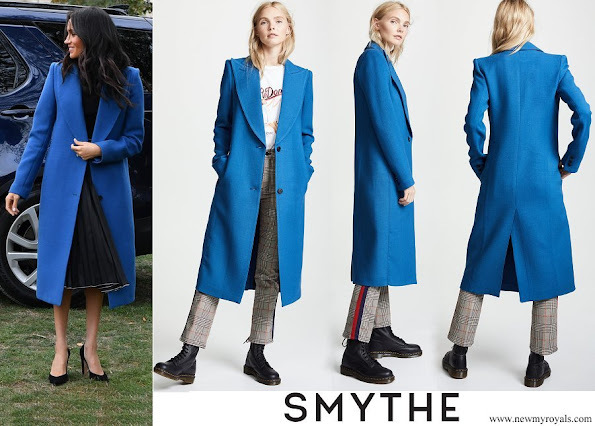 As for fashion, both women look good, this blue colour is wonderful on Meghan, but I like Dorias outfit more. I find it more flattering. I like Meghan's clothes and personality. However, can she do something about her hair? She knew they would prepare food there. To be honest, I hate people doing this kind of things - wind-blowing hair while you're preparing food. It's dirty. No matter you're Caucasian, African, Asian, etc., please do remember "Hygiene". Ces personnes qui critiquent critisueront toujours cette femme quoiqu'elle fasse. Les autres femmes de la famille royale ont invité leurs proches à des événements royaux : Camilla, Kate, Sophie et personne n'a rien dit. Si vous allez sur les sites officiels il est que c'est un projet mené et par la Duchesse de Sussex. Son mari et sa mère étaient venus la soutenir. Et c'est normal qu'ils étaient en retrait. Quelque soit ce qu'elle portera, dira ou fera sera toujours sujet à la critique inutile car certains ne peuvent accepter que cette femme soit métisse. C'est bien triste ...même la famille royale britannique réputée pour sa rigidité a fait preuve d'ouverture et d'intelligence. Au départ ce blog qui était un blog de mode est en train de dévier. Thank you. I'm sick to death of their ugliness! I'm concerned that race has entered in this forum. Maxima and Letizia among others have also been criticized by the way they dress or behave. Meghan also has her critics that don't care about the way she dresses or acts. Period. I don't think skin color or family background has anything to do with fashion. Looove Ms. Ragland's outfit. It is cut beautifully, the scarf is a graceful touch, and the soft colors are scrumptious. Wow fancy bringing someone to the event who the women can relate to!!! Shame Shame Shame. Honestly, do you think Prince William would have been better suited. Doris is the perfect person. Meghan and Doria radiate warmth, empathy and understanding and are the perfect people to support this launch. Bravo to them for being progressive in their outlook. I suppose the “common” comment is because of the affection Meghan shows. Good for her, she is the future and I believe moving the BRF in the right direction. Love the coat and good for her wearing black, just follow Maxima if you don’t like black!! It is a fashion blog,but since some distanced themselves from the subject there goes,Maxima's father belonged to the bloodttsty government,as such the Dutch gevernment of the time did not even allow the presence in the marriage,Letizia sometimes takes the mother and grandmother to the theater and museum in official events,Charlene's parents,brother and sister in-law are always present in offiaial events,dances and receptions the same for Mary's father,Katherine parents always stick to Ascot,Winbledon and theater and use the proximity of the Royal Family to the business.Meghan's mothet?Discreet,educated but not white and this is the great crime of she is accused.Diane I d explained what is an official act,and still continue with this nonsense,and do not tell me that it has nothing to do with ethecity you and Meghan.Shame. Anon I SAID IT DOES HAVE TO DO WITH HER BIRACIAL ROOTS. No need to shame me. Hysterical? Me? Have you read your commment above? Pot.Kettle.Black that is an American saying. Figure it out. You take care and Bless Your Heart (another American saying). I see many of our comments have been removed from many of us. I understand that. However, I will always speak up when I feel there is a scent of ugliness towards Meghan or anyone based on anything other than fashion. I have that right. Just as we all do here. Whether or not it censored is up to the admin. If the admin wants to ban me from this blog then just let me know. I have been a long time follower and have contributed in my opinion. So with that I say Adieu to you all and that I have enjoyed the time as I suspect I am about to be banned. No Emmy that is not what I said. Unfortunately all my prior comments have been deleted. But we have discussed this on multiple posts. There are many here that know and agree with my words. I am done discusing this now. Thanks, Diane! My comment agreeing with you was not posted. Meghan and her mom, Doria Ragland, look fantastic. Both women chose elegant and appropriate looks for the occasion. Love Meghan's blue coat and her engagement for a very good cause. Meghan' blue coat is fantastic. 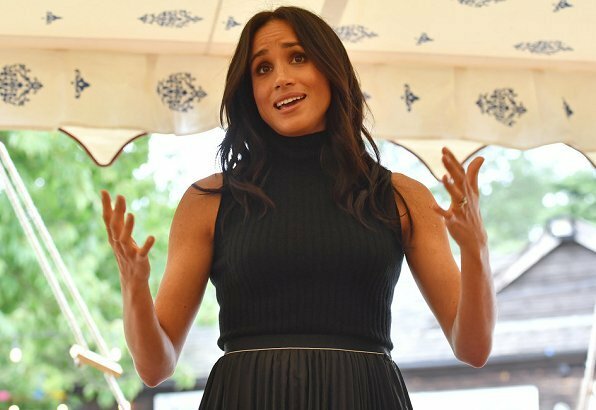 Meghan's black shirt/top are dull but smart & very much her style. Meghan's blue shoes are gorgeous. Meghan's speech was ideal for the occasion and well delivered. Harry is clearly bursting with pride and rightly so. How could anyone object to her taking her mother to an event like this? Nothing further to add, your Honour! !